18 October 2018 will open the Biesse Academy for Service, the new training centre dedicated to Biesse's entire service network, including HQ technicians, those from the separate branches, and those from authorised resellers as well as clients' operators/maintenance workers. The Academy is located within the Services Center, at Piazzale A. De Simoni, and will include classrooms and laboratories as well as, most importantly, Biesse machines, which our technicians will be able to use for their theoretical and practical training. 70 sqm for laboratories in which to conduct practical activities (with didactic work tables). 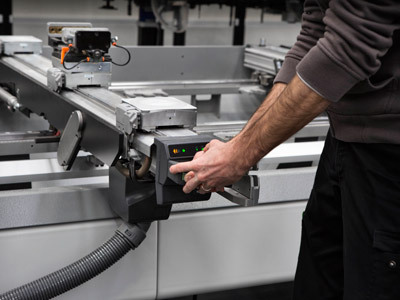 1400 sqm allocated to training machines (the Rover Edge, Akron, Stream A, Sektor, and Winstore will be the first to be installed and will later be joined by others, including the Rover Plast, Opera5, and Eko 2.1 over the course of 2019). An additional 700 sqm used by Biesse System for the drafting of other series and for pre-installation training. 9 people presently on the team, with the objective of enlarging it rapidly in order to handle ever growing training needs. More than 200 courses to be held and 900 people to train. How the project was born and what its objective is. In recent years the company has grown significantly and with surprising results, choosing to invest and believe in its own capabilities. The signs of this growth can be seen quite clearly: The employment of new resources, both in Italy and in its subsidiaries, and an increase in incoming orders, revenue, and market quotas confirm the strength of the Group, making it the number one Italian company in the sector and the second worldwide in terms of profits, with growth rates considerably higher than its main competitors. 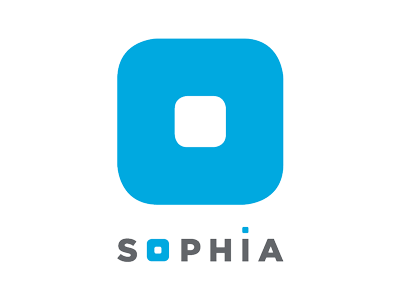 The attention which Biesse places on client satisfaction, its commitment to high quality service via the SOPHIA digital platform, and the development of its regional network are products of the investments which the company has made in strategic assets like Sales Intelligence, Services, Distribution, Marketing and Communications, and, above all, Human Resources. 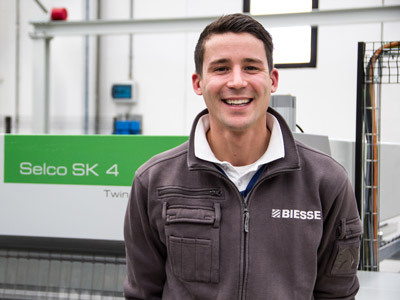 Biesse has greatly augmented its personnel and today has 4100 employees around the world and invests continuously in training and growth. This constant spirit is at the foundation of all of its initiatives dedicated to training in recent years, including the Academy. The first objective of the Academy is to enhance the skills of the "Juniors", or rather all of the younger employees who have recently entered the company (both HQ and subsidiaries) in the Service field and who must rapidly acquire the skills necessary to begin autonomously carrying out technical operations or assisting the more experienced technicians. To this end, the training being offered has been expanded with a series of courses dedicated to the Juniors, starting with courses on fundamental subjects like mechanics, pneumatics, electrotechnics, and automation, then continuing on with courses related to wood and its primary machining operations, and ending with courses focused on the installation and ordinary maintenance of our most common Biesse machines. The first session of courses will begin in weeks 40 and 41 (courses on fundamentals) for 10 new-hires from the Biesse’s Apprenticeship Service Program, while in weeks 45, 46, 47, and 48 the first sessions for subsidiaries (in English) and in weeks 50, 51, 3, and 4 of the new year sessions for subsidiaries (Spain/Italy/Switzerland in Italian) are scheduled. We are focusing on creating the skills of future generations in a way that represents an important break from the past. "We are focusing on creating the skills of future generations in a way that represents an important break from the past," affirms Stefano Calestani, Director of Service Innovation for Biesse. "Up until today 'learning by doing' has been the traditional way of training people in our sector. But this approach has often meant that people are trained in various and incongruous ways with respect to the structure." The Academy is structured in a completely different way. In this new skill centre training will follow a guided path based on standardised methods and consistent materials, from the documentation to the books. "The major difference is in the approach," affirms Calestani. "We've always seen training as a role. As part of the service we will establish different profiles and classes that are specific to each person." The new training process will start from a beginner level with a group of new graduates and will train them to become adept in the field within six months. The training will include hands-on practice, classroom teaching, coaching, evaluation, and certification. The specific phases of the process can be repeated up until one has earned his or her certification. The Academy's curriculum is a fundamental step in the professional development of the talented individuals the company is regularly hiring with the objective of strengthening its internal structure and its worldwide services.